As the 29th of April gets nearer, we’re pinning up our bunting, dusting down our tea sets and getting ready for a couple of global news interviews live from Buckingham Palace on the big day, talking about the impact of the royal wedding on the media morale in the UK. 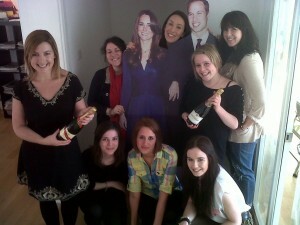 We’ve also had a little practice greeting William and Kate with some of our friends from the Brooklyn Brothers! These life-size cut-outs were delivered to media houses across the capital and can be purchased from Woolworths.co.uk!